Until recently, the one thing I knew about the Recording Academy was that they put on the GRAMMYs. I was under the impression they only celebrate Top 40 stuff, not the local rising acts I love to support. 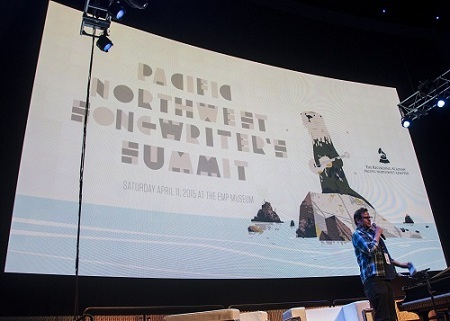 That changed, though, upon learning that the Academy puts on the Pacific Northwest Songwriter’s Summit. 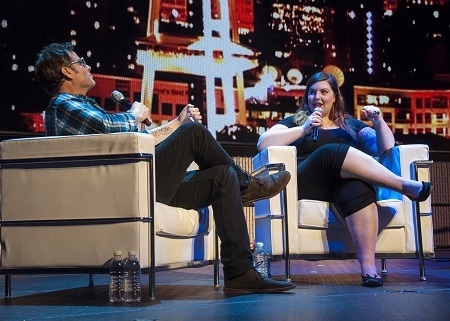 On April 11, the third annual event took place at the EMP Museum. According to the Academy, the day’s goal was to “bring together a diverse gathering of music professionals to explore the journey of a song.” Unfortunately, I was only available to attend the last two segments of the jam-packed day, but the lineup looked stellar. Speaking on panels about their songwriting processes were Seattle stars such as Shaprece, Tomo Nakayama, The Grizzled Mighty, Porter Ray, Matt Bishop and Erik Blood. Moderators and additional panelists included industry leaders like Nick Blasko (Artist Manager of Tegan & Sara), Ethan Rudin (Rhapsody), Tim Bierman (Pearl Jam 10 Club), Kate Becker (Seattle Office of Film + Music), Jack Endino (Soundhouse Recording), Jeff Mcilwain (Lusine), Jonathan Zwickel (City Arts) and Jonathan Cunningham (EMP). That’s a whole lotta music aficionados under one roof. 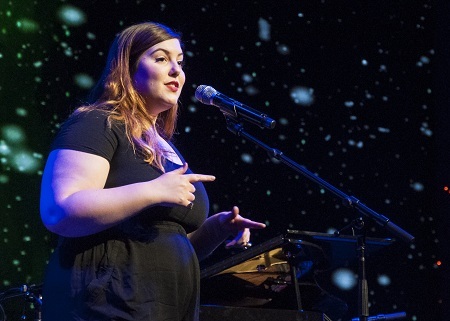 After this plethora of panels, the Keynote Presentation was provided by musician and spoken word artist Mary Lambert. Acclaimed DJ and Rock & Roll Hall of Fame member Marco Collins, who noted he’s been friends with Lambert for the past few years, introduced and interviewed her during the first portion of the presentation. I was relieved that their rapport kept the conversation natural (fun, even) as they discussed issues Lambert is known for tackling in her art – abuse, self-worth, body image and more. Lambert is invitingly open about the challenges she’s faced over the years. She intimated that her initial songwriting sprung from a dysfunctional home and sexual abuse in her childhood, as she’d escape into her room to play tunes on a keyboard. This artmaking has come full circle now, as she once wrote to “play the bad away,” and now uses music to share her truth with others who are also suffering. After the interview, Lambert moved to the grand piano on stage to demonstrate to Collins and the crowd the way she concocts and shakes up songs, much as she once did with alcohol as a bartender. “What is this song calling for or asking?” she questions herself, saying that sharing one’s truth “should be organic.” Collins then joined the audience, and Lambert moved to the front-and-center mic to lay down a spoken word piece. In curt words and curling tones, she described being a gay woman in this world, challenging homophobes, religious hypocrites, and body-shamers in a matter of minutes. From there, Lambert returned to the piano for sparkling, soul-pouring performances of a few tunes off her album, Heart On My Sleeve, including “Body Love” and “Secrets.” If you’re looking for a superheroine, this bipolar, gay woman who has overcome abuse, drug problems, and alcohol addiction is it. The evening ended with a networking mixer set to the tunes of Hey Marseilles. At first I was surprised they’d have anyone try to follow up after Lambert, but the band’s string-laced indie rock proved to be an appropriate soundtrack to the connections and conversations throughout Sky Church. The six-piece is set to tour through parts of Canada and the US this May and June.